A number of peppermint traditional remedies are supported by both in vitro and clinical research on the whole plant and one of its main phytochemicals, menthol (a secondary alcohol produced by the herb). Peppermint oil (obtained via steam distillation from the fresh aboveground parts of the flowering plant), for example, is one of the most widely used complementary and alternative medicine therapies for irritable bowel syndrome and indigestion. Peppermint oil acts to reduce gastrointestinal smooth muscle motility, possibly by acting as a calcium channel antagonist. It is also commonly used for pediatric digestive problems. Peppermint is also commonly employed in the food and pharmaceutical industries for its cooling and soothing properties as well as for its scent and flavor. Other applications with potential include as a spasmolytic during endoscopic procedures, and for the soothing of symptoms associated with respiratory infection and distress. Nasal congestion: Traditionally, 3-4 drops of oil added to hot water and inhaled has been used as needed. Nausea and vomiting: inhaled peppermint oil from a bottle have been used. Performance enhancement (cognitive and attentional function): Four drops of essential oil applied to a diffuser pad and placed inside a work cubicle to enhance memory and alertness has been used (177). Digestive disorders: Peppermint oil (0.2-0.4mL) three times daily in dilute preparations or suspension (duration not indicated) has been used. Dyspepsia: Two capsules of peppermint oil has been taken orally three times daily for five days postoperatively (152). A single dose of peppermint oil (0.2mL) in water (25mL) has been taken prior to a meal (153). Irritable bowel syndrome (IBS): Peppermint has been taken orally in doses of 187-500mg or a 0.2mL liquid formulation 1-4 times daily for up to four weeks (154). 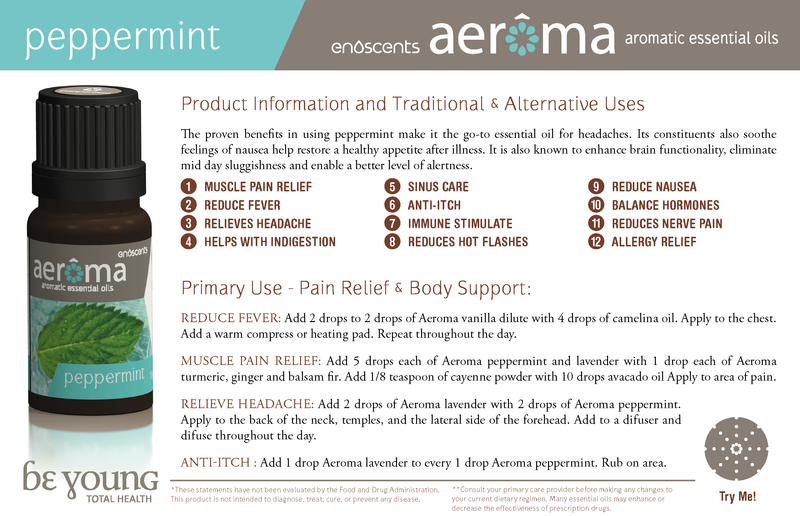 Sore throat: Lozenges containing 2-10mg of peppermint oil, as needed, have been used according to secondary sources. Abdominal distention: Peppermint oil (0.5-1.0mL) with 2L of hot water soaked into a towel has been placed on the abdomen for 20-30 minutes three times daily (168). Postherpetic neuralgia: Peppermint oil has been applied topically and massaged into the skin 3-4 times daily. Note: Avoid topical use of peppermint oil around the facial or chest areas of infants and young children, especially around the nose, as menthol can induce apnea, laryngeal and bronchial spasm, acute respiratory distress with cyanosis, or respiratory arrest if applied directly to these areas (145). Alzheimer's: According to secondary sources, peppermint may interact with Alzheimer's herbs and supplements. Analgesics: Based on a variety of research (human, animal, and in vitro), menthol has been shown to exert a direct antinociceptive effect (137;​225;​226;​227;​228;​229;​230;​231;​232;​233). Menthol has also been observed to improve the analgesic efficacy of tetracaine topical gel, partially through enhanced percutaneous permeation, in animal study (136). Antacids: According to secondary sources, agents that decrease stomach acid and increase gastric pH may cause premature dissolution of enteric-coated peppermint oil. Antiarrhythmics: In human research, patients using peppermint oil reported cardiac disorders, including abnormal ECG such as supraventricular premature beats, ST segment depression, and premature ventricular contractions (117). Antibacterials: Based on in vitro research, peppermint oil and menthol may have synergistic effects with some antibiotics like ciprofloxacin (11;​234;​235;​236;​237). These effects may be dependent on concentration, food pH, composition, storage temperature, and the nature of the microorganism (236). In human research, peppermint had synergistic effects with TMS forte (160mg trimethoprim and 800mg sulfamethoxazole) (238). Antiemetic agents: In human research, peppermint oil reduced the incidence of nausea (176) and peppermint has also been reported to relieve pregnancy-induced nausea and vomiting (63). Antifungals: Synergistic effects against Candida albicans have been noted in vitro when peppermint essential oil was used with amphotericin B (237). Similarly, in laboratory study, menthol was found to enhance the efficacy of topical ketoconazole (135). In other laboratory work, peppermint displayed fungistatic and fungicidal activity against various fungi (21;​239). Based on animal study, peppermint oil and menthol may be effective against Candida albicans, Fusarium oxysporum, Fusarium verticillioides, Trichophyton mentagrophytes, Trichophyton rubrum, Trichophyton tonsurans, Penicillium chrysogenum, Aspergillus niger, A. flavus, A. fumigatus, A. sulphureus, Mucor fragilis, and Rhizopus stolonifer (101;​240;​241;​242;​243;​244;​245;​246;​247;​248;​249). Antihistamines: In animal research, 50% EtOH extract of peppermint inhibited histamine release at a concentration of 1mcg/mL (250). Anti-inflammatory: Peppermint has been reported as exhibiting dose-dependent anti-inflammatory activity in animal research (252). In human research, a mixture of naturally-occurring plant oils, containing peppermint, exhibited marked anti-inflammatory activity in epithelial cells of the upper respiratory system (253). Antineoplastic: In vitro research demonstrated that peppermint oil can revert tumor cells back to a differentiated state (254). Based on animal research, oral administration of Mentha extract may have chemopreventive and antimutagenic effects, possibly due to its antioxidative and radical-scavenging properties (34;​255). Antioxidants: Peppermint exhibited antioxidant activity (15;​16;​17;​18;​19;​20;​21;​22;​23;​24). It has been shown to act as a radical scavenger and inhibit lipid peroxidation (24). In other experiments, peppermint essential oil demonstrated antioxidant activity in a linoleic acid emulsion system by inhibiting conjugated dienes formation by 52.4% and linoleic acid secondary oxidized product generation by 76.9% (at 0.1% concentration) (23). In vitro research reported that Mentha piperita L. had the lowest thiobarbituric acid reactive substance (TBARS) (278). Antiparasitics: In vitro, several peppermint extracts inhibited the growth and adherence of Giardia lamblia, the parasite that causes giardiasis (12). Antispasmodics: Scientific review indicates that peppermint's principal action is a dose-dependent antispasmodic effect on the gastrointestinal tract (157;​256;​257;​258;​259). Antitussives: Based on animal research and widespread anecdotal evidence, menthol may have antitussive effects (260). Antiulcer: The commercial combination product STW-5 (Iberogast®), which contains extracts of peppermint leaf, as well as other herbal components, has been demonstrated to exert a dose-dependent antiulcerogenic effect associated with reduced acid output, increased mucin secretion, increased prostaglandin E2 release, and a decrease in leukotrienes (261). Antiviral agents: An antiviral substance was detected in peppermint oil with activity against the Newcastle disease virus (NDV), herpes simplex, vaccinia, Semliki forest, influenza A virus, and West Nile virus (262). In laboratory research, peppermint exhibited high virucidal activity against herpes simplex virus type 1 (HSV-1) and herpes simplex virus type 2 (HSV-2) (40;​263). Additionally, it has been found to have activity against the acyclovir-resistant strain of HSV-1 (263). Anxiolytics: According to secondary sources, peppermint may interact with anxiolytics. Cardiovascular agents: A small cardioaccelerating effect has been observed following menthol administration in human research (114). In a case-control study assessing peppermint oil as an antispasmodic, one patient (N=40) experienced bradycardia and one experienced a sympathovagal response, which was on par with the adverse effect rate seen in historical controls using glucagons (116). Atrial fibrillation has also been noted in a case report (115). Expectorants: According to secondary sources, peppermint may interact with expectorants. Gastrointestinal agents: In human research, gastrointestinal upset, including diarrhea (117), nausea and vomiting (110;​112), and abdominal pain (105;​112) have been reported. Hormonal agents: Peppermint has been shown to have antiandrogenic effects in rats and may be associated with diminished libido (38). In human research, peppermint tea was observed to reduce the level of free testosterone in the blood, without affecting the levels of total testosterone and DHEA (38;​113). Based on animal research, the mechanism may involve spearmint-induced oxidative stress in the hypothalamus as well as testicular antiandrogenicity (altered levels of gene expression, enzymes, and hormones) resulting in decreased synthesis of LH and FSH, which in turn downregulate the production of testicular testosterone through the disruption of a number of intermediate cascades (267). Hypoglycemics: According to in vitro research, the phenolic compounds and antioxidant activities found in peppermint tea may have hypoglycemic effects (141). Hypotensives: Calcium channel-blocking activity of peppermint oil has been observed in animal models (251) and, in theory, peppermint oil may add to the effects of agents that may also theoretically drop blood pressure. Immunosuppressants: Based on laboratory research, the peppermint constituent alpha-humulene may increase interleukin-8 (IL-8) secretion (268). Insecticides: In human research, a product called Terminix(®) ALLCLEAR(®) Sidekick Mosquito Repeller (containing cinnamon oil 10.5%; eugenol 13%; geranium oil 21%; peppermint 5.3%; and lemongrass oil 2.6%) provided significant protection against mosquitoes; however, the mechanism of this protection is unclear (59). Neurologic agents: In human research, headaches (117) and worsening of headache (118) have been reported. Osteoporosis agents: Metabolites of (-)-menthol inhibited bone resorption in vitro (60)..
Performance-enhancing herbs and supplements: According to human research, peppermint aroma may have beneficial effects on cognition, attention, and alertness and improve tactile performance (177;​272;​273;​274). Radioprotective agents: Peppermint has been shown to have protective effects against irradiation in animal research (66;​67;​68;​69;​70;​71;​72;​73;​74).